At 32 she met St. Francis de Sales after a mystical vision while praying for a spiritual director. On love for Christ she made a private vow of chastity to which she added obedience to his direction, while continuing to provide for her children. 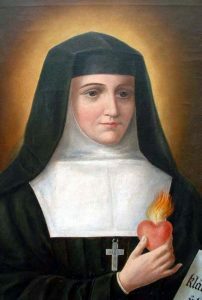 By 45 all of her family obligations were met and with Bishop Francis de Sales founded a religious institute for women, the Order of the Visitation, giving witness to the virtues of the Virgin Mary at the time of the Visitation. The Visitation sisters accepted women who were rejected from other religious orders due to age or illness, and were notable for their active charitable works. Jane’s counsel was sought by all people, high and low in society. She also traveled extensively to found new Visitation houses, leaving 86 at the time of her death, and 164 at the time of her canonization.